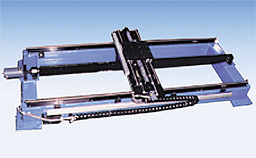 Both axes use chrome plated round rail linear bearings and chrome plated rolled ball screws. Both axes have linear encoders and bellows protecting the individual screws. The 10 foot (3 m) by 3 foot (I m) X-Y axes are mounted to a stress relieved steel structure.